Day1: We finally stepped off the plane in the Northern Hemisphere around 6pm Sat 20th Oct. As we'd arrived after sunset we could see all the skyscrapers and the multitude of lights the whole bus trip to our hostel. We were staying in the Wan Chai / Cauaeway Bay area on the island in a place called YesInn which was pretty nice with triple decker bunk beds :D Was a long day ( we'd got up at 2am for our flight from Cairns) so after a quick stint in the massage chair (brilliant addition for a hostel, must say) I went to bed while Mike stayed up learning Mandarin. Hong Kong we found was a great intro to Asia as they all speak English which is great, so we managed to buy our train tickets to Beijing with ease. After a wander around Kowloon ( along the Promenade past all the posh hotels and Hong Kong's own Walk of Fame featuring Jackie Chan, Bruce Lee and a giant gold Pig... :S) and a trip on the famous (tbh never heard of it before) Star Ferry back to Wan Chai, we met up with Thomo (now living it up in HK) Was really nice seeing him again. He's been busy since he left 93 to go off travelling last year. He took us around Causeway Bay and to a cheap little eatery (2 courses and a drink for like £5 each after Australia was amazing) The streets and shops were so busy even at 9pm they were still going which was crazy. Was cool seeing all the neon lights and finally tasting some lush Cantonese food. Day 3: Monday we decided to get back on our sightseeing, and for this we needed a bus. Not any bus, but a Big Bus of the open top variety. Was great. We went all around Hong Kong Island and Kowloon listening to a very British man talking about Hong Kong's history and developing skyline as well as taking a Night Tour through town which actually was pointless and we were in traffic for ages. The day finished off in a Cantonese restaurant - was ok except the English translations on the menu weren't clear and the waiters couldn't work out what we wanted so we just had to hope for the best. Which turned out into a lush meal though so was worth it. Day 4: Our train to Beijing wasn't until the afternoon so we got out early, jumped back on our Big Bus and took the Peak Tram to Victoria Peak- views were great but the smog meant you couldn't really see over the water much. We braved the metro with all our stuff and made it to the train on time. As it was a 24hour train we got soft sleeper tickets - 4 bunk cabins- which we lucked out on as we got it to ourselves (think the fact it was a bank holiday in Hong Kong had something to do with it). The train was brilliant- £70 and we got to sleep most of the way so felt much nicer than our other long haul flights. Although we had prepared by buying our instant noodles for the train before hand, when the train attendant came round with menus for the evening meal, we decided to order stuff. Mike went for something potatoey and mine was 'vegetable noodles'. Safest on the menu I thought. Mike's came out as potatoes and pork with rice. Looked great. Mine was just disgusting. I had pak choi with what looked like fish innards and rice. All I ate was rice that night. Welcome to Chinese cuisine. Yay :S To make matters worse the food was making me gag so I decided to take all the dishes to the bin, stacked on top of each other. Once near the bin I hastily threw them all over the floor. Mike heard my screams of "Oh no!" from down the corridor and came to help. It was a right mess. So I went back to the room to get tissues, but couldn't find them. So Mike was left clearing up fish innards off the floor whilst the locals stared on tutting at him The attendant had arrived to clear it up before I got back. What a palava. Day 5: We arrived in Beijing on Wednesday, and after 2hours looking for and waiting for a taxi, we made it to our hostel - Happy Dragon Courtyard. Was lovely with a courtyard and a bar in the middle. We decided to brave it and get food straight away, quickly using the 'point at what you want' technique at the pictures on the wall. Was a lush spicy beef noodle soup so turned out well :) We had been looking for dumplings but couldn't match the Chinese name symbols to the neon lit restaurants for toffee. Day 6: Thursday we headed to the Lama Temple - based on the Tibet Buddhist Temples. Was lovely and nice to finally see something traditionally Chinese instead of high rises and generally Western looking buildings and hotels everywhere. The Lama Temple was beautiful with huge peaceful gardens walled off - it didn't feel like you were I'm a city at all. After, we headed towards the Drum and Bell Towers of the city. On the way we spotted a lovely little tea shop where we had some lunch and some tea -Mike had the Chocolate Pearl Tea, and I had the Strawberry version. More milkshake than tea but was nice. We then headed onwards but once in the Drum tower realised my watch was wrong, and we'd missed the Drum performance which was a shame. The views from both towers were rather smoggy so couldn't make out the landmarks we wanted to. Made me realise though how big Beijing is. On the way back to the hostel we noticed a cool looking street called Nanluogu Xiang which turns out was a place to see in our Lonely Planet too. The street was strung up with Chinese lanterns, lots of little shops, restaurants, street food and drinks, including take away Mojitos which was great :D I also found the perfect thing to make me more 'Asian' - a Hello Kitty bag. Ever since then i've got a little more respect (or maybe the glares are because they think i'm even more of a weirdo than before lol) We had dinner in a lovely courtyard restaurant, decked with lanterns and huge goldfish ponds, then headed back for a few drinks at the hostel. Day 8: The next day, after our first full week in China, we set out for the Great Wall. Seeing as this was the main reason we'd come to China we were pretty excited, though still a little hungover from the party we slept most of the bus journey to it. 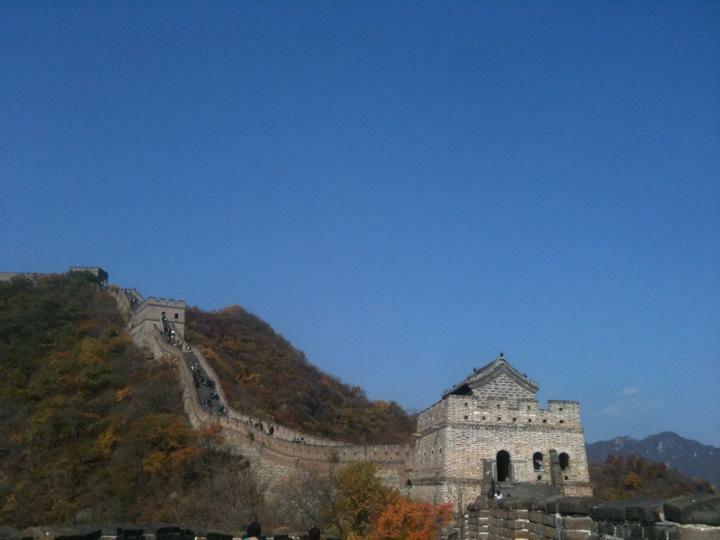 Our portion of The Wall was at Mutianyu. We were told that this portion had been rebuilt partially, but you could see some of the original parts too and it didn't disappoint. We woke up in the countryside and could just make out The Wall on the tops of mountains, undulating in the distance. Once there we left our group and headed up to the top. Now, one way to get up was a 45 minute climb up ricketty steps. Another way was to hitch a ride on the ski lift. We took the ski lift which meant we had a lot more time on the wall. The wall really was - magnificent. The sheer size of it was amazing thinking of how it was built, as well as the hues of red, green and yellow of the forests surrounding it all as its autumn here. It really looked spectacular. On the wall itself there were LOTS of steps, most uneven and quite steep. We walked along one stretch of The Wall to the unrestored are, through various look out posts, which was pretty cool to see. The unrestored part had bushes and trees growing on it and through the cracks in the floor, as well as parts of the outer walls worn away do had to be careful. We headed back on ourselves then to the other end, but it wasn't too long before we had to go and meet our group in the restaurant in the village. Now after our lazy journey ONTO The Wall, we probably should have walked down. Instead we just had to try the Toboggan Ride down. Who ever came up with this idea to stick a toboggan ride on the side of one of the Wonders of the World I have no idea. After 45 minutes of queuing for it though and sliding down a tin can shute on a plastic tray, was a pretty fun way to come down. We met with the rest of the group and has some excellent lunch of rice and various dishes of sweet and sour chicken, stir fried beef, pork, tofu and all sorts. Was lush. If all of China turns out like this I'll be very happy. We headed back to Beijing then out for our first of many dumplings. We'd been told about a great place for dumplings on our first night but could not find it by matching the written name in Chinese characters to the neon signs. Eventually we asked a few people and found it. Was pretty great - Mike had pork with pickled cabbage and I had pork with sweet corn. Both were great (Mike munched through 14 and I had 10). Yum!